When friends and neighbors drop by these days, I often find myself apologizing for the homeless encampment look of our backyard: the clothing strung up on the arbor, a little city of cardboard boxes my two-year-old drives his toy cars on, and gobs of cups, buckets and shovels spilling out from the kiddie pool and sandbox, etc. I'm hopelessly didactic, so I'm likely to point out the conservation mantra: reduce, reuse, recycle. 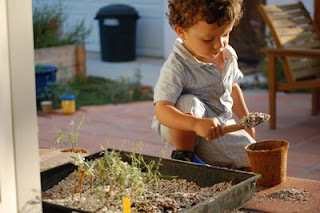 A lot of the mess keeps my son busy while I tend to fruit and vegetable plants. 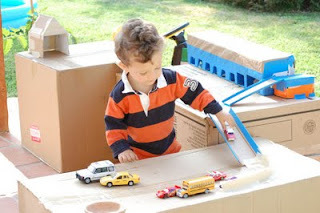 The box garages (below) is one of our attempts to reuse some of the miles of cardboard that come with kid stuff. The clothesline is retractable and is strung between poles of a shade structure that covers our patio. On hot Southern California days it's ridiculous to turn on your dryer, then crank up the AC. According to National Geographic's The Green Guide, a typical dryer emits 1,450 pounds of the global warming gas CO2 a year. That's equivalent to driving the average car more than 1,400 miles. We have an efficient, Energy Star dryer and it's powered by our solar electric system (at least during the day), but a hotter house increases the likelihood we'll have to leave the AC on when it's dark and I'm already feeling parched as a prune. (Running the dryer at night, as recommended for folks without their own generation, would require power from the grid.) 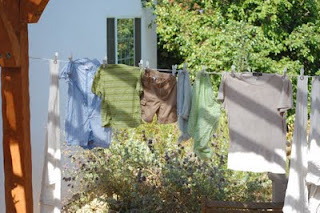 Besides, when outside temps hit 90 degrees, clothes dry faster on the line. And sunlight bleaches out many stains. Unfortunately, my kid's too little to reach the line. But I like to think he's getting a good demonstration of evaporation. Click here for more simple ways to cut your carbon. Got a conservation tip? No idea is too modest. Please share. Conservation biologists say, globally, we are in the midst of a mass extinction of species: because of human activities, earth's plants and animals are winking out at more than a thousand times the natural rate. Conservation International lists California as one of the planet's biodiversity hotspots--places with a lot species that don't live anywhere else, many of them vulnerable to extinction. California (including a slice of Baja California) is especially rich in rare plants. More than 2,000 species are endemic (i.e. only found here). You can grow many of these plants--and their cultivated cousins--in your own yard, providing shelter and food for local animals. 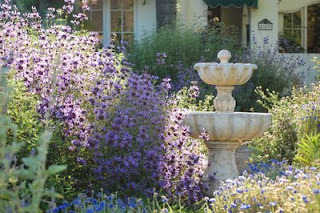 To learn more about gardening with native plants, find the "gardening" label on the right-hand side of this blog. Non-native plants can also shelter and feed animals, including humans. I write about some of these, too--especially those that are better adapted to our climate. I frequently post hikes and bike rides that are suitable for the whole family. Hikes are broken down into regions: Angeles National Forest (ANF), San Fernando Valley (SFV), and Los Angeles (LA). (More regions soon.) Kid-friendly hikes are usually dog-friendly hikes as well. Rambling LA also features information on nature classes and projects, as well as mini-reviews of field guides, nature and gardening books, etc. Soon I'll debut a new urban nature column to be featured here and on our sister site, Chance of Rain. I'm an environment reporter. That's not the same as an environmentalist. Environment reporters write about, you guessed it, the environment. We care deeply about the earth, but remain open as to solutions and approaches to problems; we recognize the variety of perspectives on environmental issues. Still, that doesn't mean I'm going to sit back and watch our planet fall apart. A few years ago, I profiled Andy Lipkis, founder of TreePeople. He told me that the adage "you can make a difference" was a lie. The reality, he said, is "you do make a difference": every day, for better or for worse, your choices affect the earth. So here's where I'm going to lay it on thick: Folks, the climate crisis upon us. Future generations--for some of us, our own children and grandchildren--are going to ask some searing questions. How could you let this happen? Why didn't you do more? Didn't you care? You won't be able to feign ignorance. Don't lurk under the covers. Explore, learn, protect. My two-year-old now wants definitions of everything. "What's American flag?" "What's is that cloud?" I know that the whys can't be far behind. Fortunately, we'll have a little help. Since he was a year old we've been reading the marvelous "Let's-Read-And-Find-Out Science"(HarperTrophy) books. This vast series has two tiers. Stage 1 books are for preschoolers and kindergarteners (age 3 to 6), but with some occasional editing, you can read these books to toddlers, too. Stage 2 books are for kids in elementary school. My son's first favorite was "From Seed to Pumpkin." This lovely book follows the plant's growth, culminating with Halloween and pumpkin pies. Unlike some other science books for kids, this series often puts the information in a narrative, which is appealing for little kids. That last book is the reason my two-year-old says he's going to "migrate" from one pillow den to another. The fish book stars a goldfish--handy if your kid has one. It also offers instructions on setting up a fishbowl. Other titles include "From Caterpillar to Butterfly," "A Tree is a Plant," "What Makes a Shadow," "From Tadpole to Frog," and "Sleep is for Everyone." We also love "About Amphibians: A Guide for Children" (Peachtree Publishers). It's part of a series that has even simpler text, suitable for very young children. More complex information is found in an afterword. The chief virtue of these books, aside from the simplicity, are the gorgeous illustrations. They were written by Cathryn Sill and illustrated by her husband, John Sill, a prize-winning wildlife artist. We also own their "About Fish: A Guide for Children." Finally, a word of praise for Aliki, the prolific author of many books for children (including some of the Read-And-Find-Out Science series). Her "Quiet in the Garden" is beautifully illustrated. This simple text about animals (and a boy) eating in a garden is perfect for babies and toddlers. More great books for little kids. 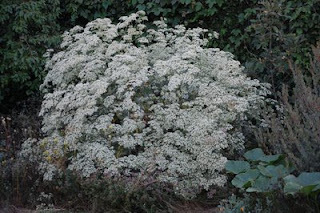 One of my favorite California native plants for gardens is St. Catherine's Lace (Eriogonum giganteum). As its botanical name implies, it's the giant of the native buckwheats, growing four to nine feet tall and as much as 10 feet wide. It is big and beautiful. Just when most of my other plants are hunkering down for the hot summer, St. Catherine's Lace comes on strong. First, it bursts with lacy patterns of tiny white flowers. Then, at the end of summer, the dried-up blooms turn rusty red, looking equally gorgeous in the fall. Many native buckwheats have a similar blooming pattern. Next time you're hiking local hillsides, look for Catherine's (more widespread) relative California Buckwheat (Eriogonum fasciculatum). California buckwheat is common in both coastal sage scrub and chaparral habitats. It sports little balls of white or pink-tinged flowers that age to a rust color. Bees love them. Learn more about Southern California's unique coastal sage scrub and chaparral habitats. I'm not one for taking online quizzes. I could not resist, however, to try the What Kind of Frog Are You? survey on AllAboutFrogs.Org. I'm not sure how preferring butter to margarine equates with being a nocturnally hooting, toxin-secreting amphibian, but I'm still chuckling at my result: Oriental fire-bellied toad. At my house we have five pets. One goldfish, named Pumpkin Pie, and four Bombina orientalis (i.e. Oriental fire-bellied toads). They're named Steinbeck, Stegner, Emily Dickinson, and Joan Didion. These two-inch amphibians are excellent pets! They are incredibly easy to keep. We've had the toads for five years, leave them unattended while we're away, and haven't killed them yet. We feed them crickets twice a month; clean their tank when it looks nasty. They thrive. They coo sweet hooting sounds at night--okay, it's not so cute if you're sleeping near them. These colorful toads are very active and fun for beginner pet owners. They enjoy spending their day swimming and singing with other frogs of their species and become more active when not alone. Weird fact: Firebellied toads cannot extend their tongues like other toads or frogs. To feed, they must leap forward and catch their prey with their mouths. After they have grabbed a cricket or worm with their mouth, they usually use their fore-arms to help stuff food the rest of the way in. Then they squish their eyeballs down in their heads to push the food into their throat. Observing frogs seems to me to be an essential childhood experience. But it's getting harder to find them in the wild. Southern California's mountain yellow-legged frogs, red-legged frogs, and arroyo toads are endangered. Conservation biologists say nearly one-third of the world's amphibians are threatened with extinction. 129 may have gone extinct since 1980. 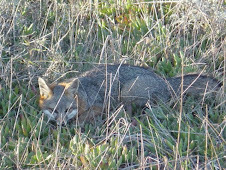 Habitat loss, disease, pollution, predation by nonnative species, and UV radiation are among the culprits. A recent study by the International Union for Conservation of Nature (ICUN) concluded climate change could wipe out more than half of all amphibians. One way to protect aquatic life is not to use pesticides in your yard. This tip sheet from the US Fish and Wildlife Service offers several ideas for keeping your garden environmentally sensitive. Meet "Urna Thurman," a recent addition to our garden. 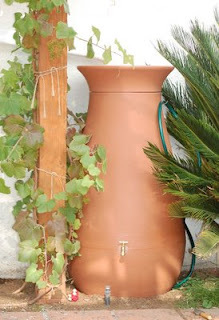 This rain barrel is attached to a downspout from the roof. When we added thirsty vegetables to our otherwise drought-tolerant garden, I knew we'd have to look for additional water savings strategies. Because Southern California relies heavily on imported water, conserving it is crucial. Transporting water long distances requires a lot energy. Indeed, according to the state Department of Water Resources, nearly 20 percent of all power used in California goes to move and treat water. Wasting it is shooting ourselves in the foot, so to speak, because the more greenhouse gasses we pump into the air, the more we exacerbate global warming. One of the most certain projections about the effects of global warming is the decline of snowpack in places such as California's Sierra Nevada. We rely on snowpack as a kind of reservoir that stores precipitation when actual reservoirs are full and water demand is lower, saving it for drier months. Ecosystems, too, rely on gradually melting snow fields to feed streams and water forests through the warmer months. Southern California also imports water from the Colorado River, where early snowmelt and more intense drought cycles will also wreak havoc. This is on top of the ecological carnage created by Southern California's diversion of water from places such as the Owens Valley and the lower Colorado River. I bought Urna from Gardener's Supply Company. She wasn't cheap (more than $200), but isn't she shapely? It'll be a longtime before the amount I save on my water bill adds up to the cost of the barrel. That's not the point. I love mountain yellow-legged frogs and other species in our gorgeous Sierra. I can't bear to hasten their decline. Gardener's Supply sells cheaper versions. You can also make one. Here's a link to a $10 version. Storing water is also part of my earthquake preparedness plan. To learn more about the projected impacts of climate change in California, check out my radio series. 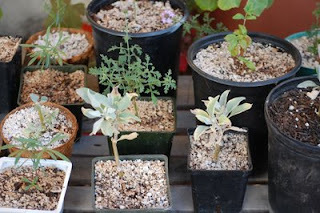 For help with sustainable gardening, consider one of the dry gardening events on Emily Green's Change of Rain blog. 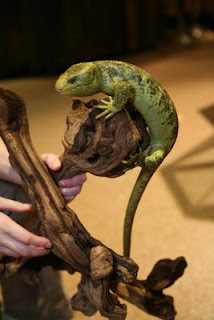 It's clear where my son and I will be this Saturday: Gawking at scores of gorgeous critters on display at the LA County Natural History Museum's "Reptile and Amphibian Appreciation Day," including Tallulah, the museum's Solomon Islands Skink (pictured above). Featured guests include lots of (live) frogs and turtles, two American alligators, a 13-foot python, and all of California's native rattlesnakes. Herpetologists will be on hand to answer your questions. The event will also feature presentations/activities that explore the relationship between modern reptiles and dinosaurs. The shindig runs Saturday, July 11, from noon to 5 p.m. It's free to members or included with your regular museum admission ($9 for adults;$6.50 for children). But note, parking in the area is now $8.00. For kids 3-5 years old, check out Critter Club at 10 a.m. Kids will learn about reptiles and amphibians through exhibits in the Discovery Center, as well as stories, games and a craft. This is free (with paid museum admission), but spaces are available on a first-come basis. For more info, call 213-763-3230. More of my writing on the Natural History Museum of Los Angeles County. It also smells divine--or, rather, earthly, as it's sweet-spicy-conifer smell recalls the Southern California hillsides where clevelandii grows wild. The most frequent comment I get about my front yard is, "It smells amazing." My three dear 'Winifreds' are largely responsible, although you'll get a similar aroma from several sages. 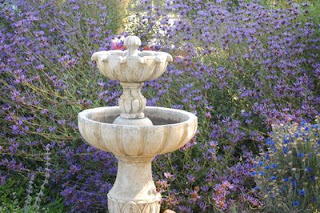 Plant salvias and your garden will be blessed with bees, butterflies and birds. Hummingbirds sip nectar from my 'Winifred Gillmans' and my Salvia spathacea (commonly called hummingbird sage), as do bees. Birds will feast on the seeds that develop if you don't prune the spent blooms. And why would you? The globe-shaped calyx (a protective structure at the base of the blossoms) is also lovely. The only hitch: M. Nevin Smith, author of Native Treasures: Gardening with the Plants of California says 'Winifred' needs well draining soil, more so than other sages. 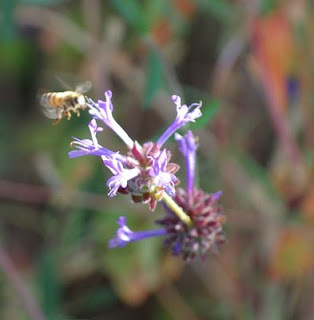 More on gardening with California native plants. 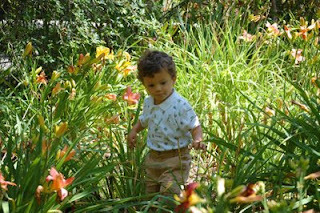 Public gardens are wonderful spots for little kids. They're brimming with simple pleasures such as hiding in a patch of lilies or running over a bridge. 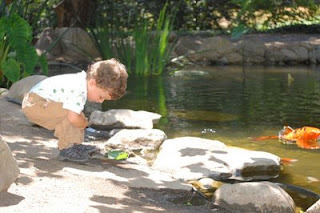 One of my son's favorites is Descanso Gardens in La Canada. I suspect it's mostly because of the train ride, but I know he appreciates other delights here, too, including talking to the ducks. 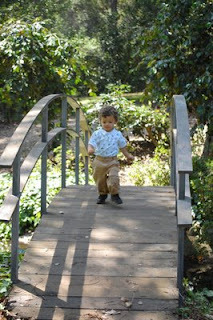 This summer we signed up for the garden's Toddler Treks with Acorn Bear class. I was so looking forward to this, but it was a disappointment. You don't trek with a bear of any kind, nor any guide. I suspect Acorn Bear is a small teddy that sits on a table out of the kids' reach, but I don't know because we weren't introduced. We did meet Mr. Patches, a sweet older man who reads stories. Unfortunately, garden staff enrolled too many toddlers--and babies--so, at the first class, it was hard to hear the story. The next week, Mr. Patches scolded parents who didn't keep kids quiet, which resulted in angry exchanges between some parents and Patches. In this program, stories are followed by crafts. Then parents and kids are given a map of things to explore on their own in the garden. I mumbled to a friend that perhaps the class was a ploy to draw kids into the vicinity of the pricey train rides ($3 for a short ride). We enjoyed our ramble, including excursions not on the map. I got a kick out of the koi that jump when you approach Mulberry pond (photo above). But you can have just as much fun--and save the $75--exploring the garden anytime. At the entrance, look for a new brochure entitled "Jurassic Journey," a family guide for exploring the ancient plants in the garden. It invites kids to imagine the dinosaurs that supped on ginko trees, redwoods, ferns, and cycads, at a time before there were flowering plants. Next month, Descanso offers Family Fun for Nature Nuts, a series of four Tuesday, early evening programs that includes a look exotic animals, brought in by handlers. For toddler classes with more focus on learning about nature (and teacher/guides), try Family Nature Walks at the Arboretum, Aqua Tots at the Aquarium of the Pacific, or Toddler Totes at the LA Zoo. These venues, as well as the Natural History Museum of Los Angeles County, also offer classes for older kids. More from me on Descanso.